SayfieReview.com - Featured Column - Who ARE the NPAs? 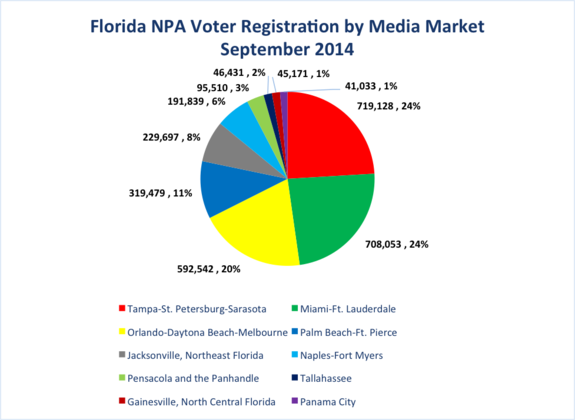 Many news articles of late focus on the growing number of Floridians registering as having No Party Affiliation (NPAs). 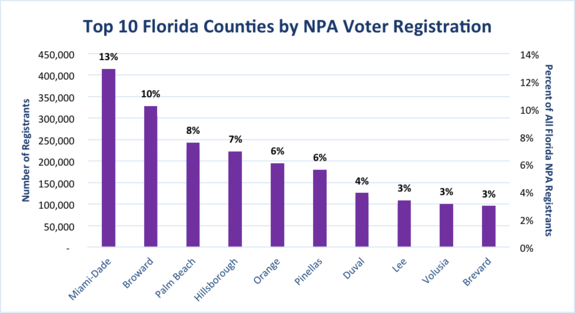 NPAs (true independents) now comprise nearly one-fourth of the state’s registered voters—a much larger portion of the Florida electorate than true third (minor) parties. 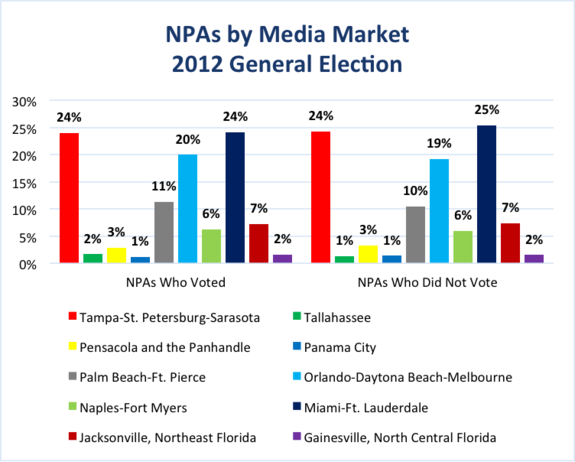 Traditionally, NPAs are the hardest to gauge in terms of whether they will vote, and, if so, for whom. But their surging numbers are such that the two major parties cannot afford to ignore them. NPAs are a force to be reckoned with in 2014. Here is a summary of the data presented in the graphic overview at the end of the column. 1. 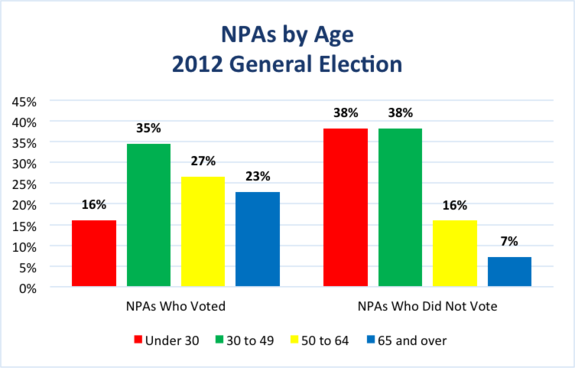 61% of all NPAs are under age 50 (25% age 18-29; 36% age 30-49). 2. NPAs make up a larger share of the total number of registered 18-29 year olds (33%) than of older cohorts. The NPA share declines across age cohorts. 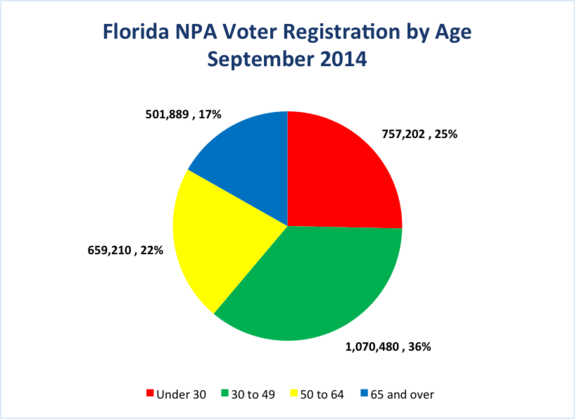 (Among registrants 65 and older, just 15% are NPAs). 3. 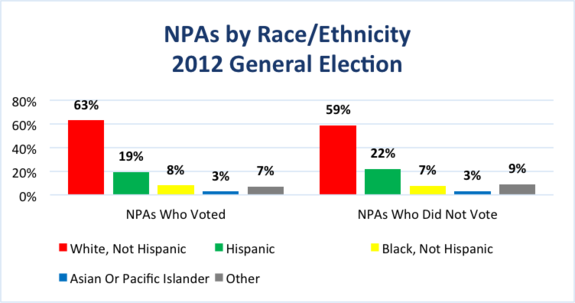 Whites make up a majority of registered NPAs (61%). 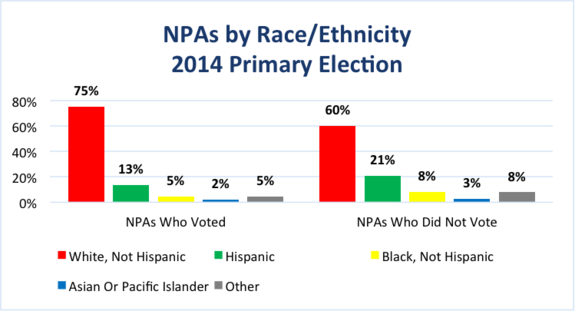 Hispanics (20%) make up a larger share of NPAs than do blacks (8%), Asians (3%), or other minorities (8%). 4. 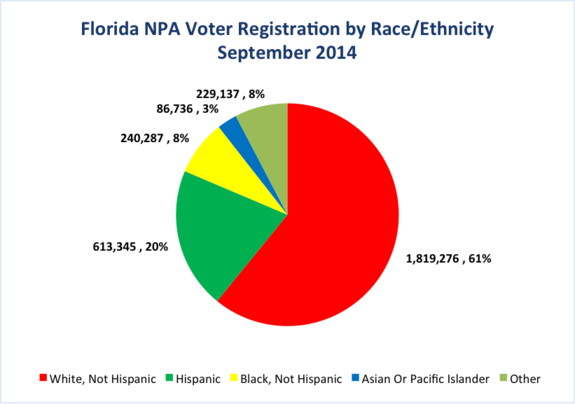 NPAs are a larger share of the total number of Asian (40%) and Hispanic (33%) registrants than of black (14%) or white (21%) registrants. 5. 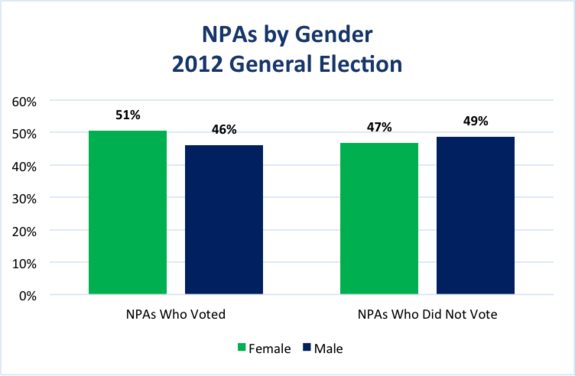 Females (51%) make up a slightly higher percentage of registered NPAs than do males (49%). 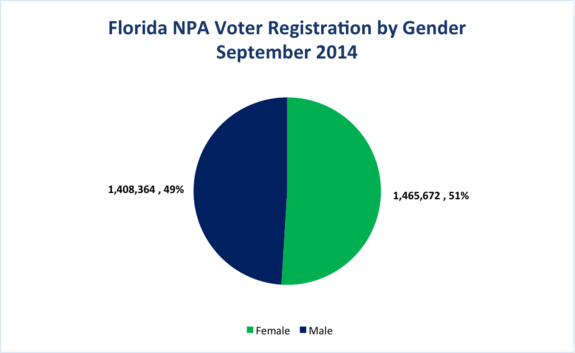 However, NPAs comprise a larger share of total male registrants (24%) than females of all female registrants (22%). In general, gender differences are much smaller than either the age or race/ethnicity differences. 6. 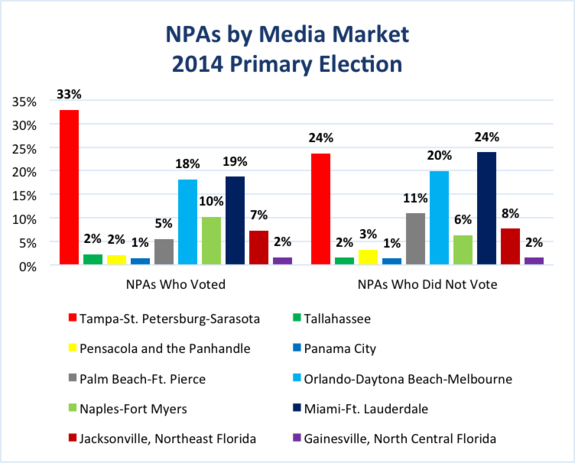 44% of all the state’s NPAs live in the I-4 Corridor media markets (Tampa and Orlando). 7. 31% live in three heavily-urbanized South Florida counties (Miami-Dade, Broward, and Palm Beach). 8. 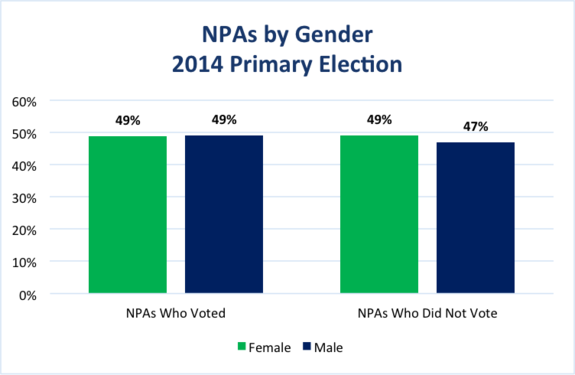 The turnout rate of NPAs in the 2012 presidential election was 61% and in the 2014 primary (4%). Each was below the statewide average (2012—72%. 2014—18%. (In fairness, NPAs could only vote in nonpartisan or universal primary races in the 2014 primary cycle. )The turnout rate in 2012 was highest among females, blacks, and older NPAs. 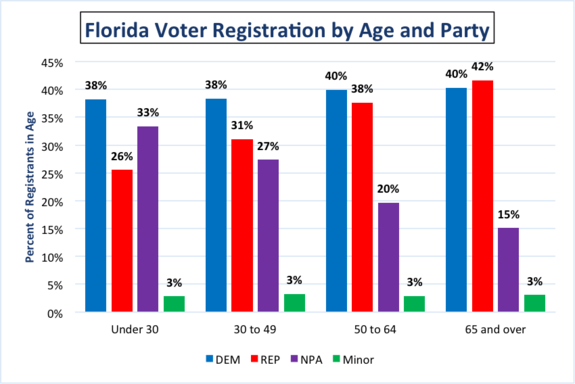 Turnout differentials by age, gender, and race/ethnicity were much sharper in the 2014 primary. 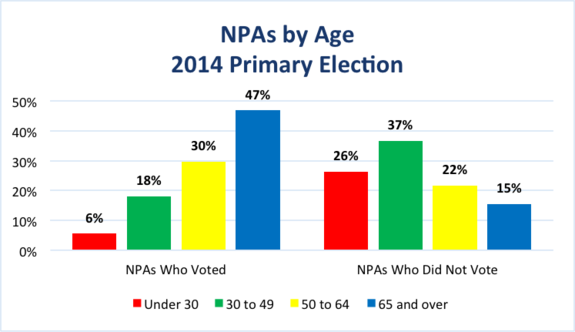 NPA turnout in the 2014 primary was highest among males, whites, and older registrants. 9. "Independents" (NPAs + minor parties) comprised a larger share of voters in the 2012 presidential election (33%) than in 2010 gubernatorial election (29%). (Source—exit polls). 10. The candidate who wins the NPA vote wins the election. Scott won the "independents" in 2010, Obama in 2012 (exit polls). Reasons commonly cited for registering as an NPA often differ, depending upon whether the voter is a new registrant or an already-registered voter who is abandoning a political party. 1. Young voters. Often see little difference between the two major parties; have grown up seeing little positive about either party AND have often been taught that it is better to judge a candidate by his/her credentials rather than simply by a party label. 2. Immigrants. 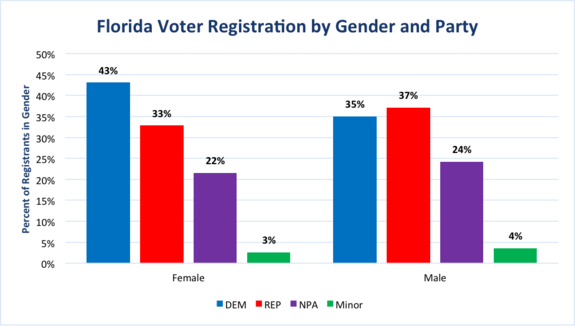 Newly naturalized citizens often come from countries with political systems not based as strongly on political parties; are less confident that they understand how political parties in Florida work or what they stand for. 3. Professional reasons: Persons in certain professions where objectivity is expected (e.g., journalists, judges) often register as NPAs. 1. Disgust with two major parties’ inability to compromise and solve key problems facing the state. They have given up hope this will change. 2. Protest. Some see parties as no longer worthy of their support, having become corrupted by outside money, much of which is used to run non-stop negative campaign ads filled with untruths. 3. Business reasons. 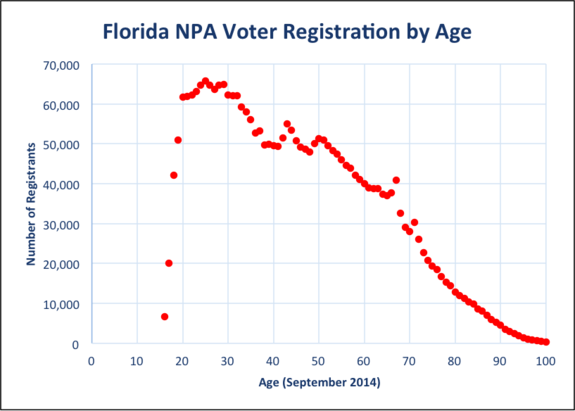 In light of the toxic nature of partisan politics these days, a growing number of voters are changing their registration to NPA to avoid losing customers. 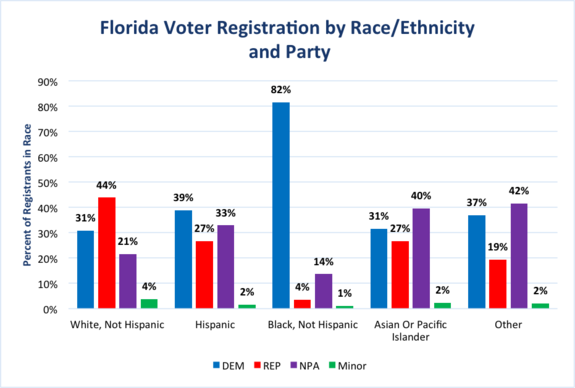 Source: Calculated from data provided by the Florida Division of Elections. *NPAs were only eligible to vote in nonpartisan or universal primary races. What Difference Did Independents’ Vote Make?